Detects up to 6 GHz frequency audio-video transmitters or bugging devices ! 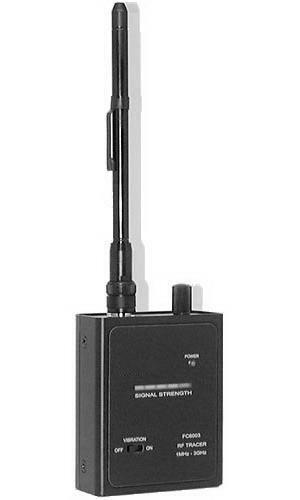 Very useful RF signal tracer in locating audio-video transmitters or bugging devices, concealed everywhere like room or car. Suitable for both private and professional users the ACE-RF is a valuable allied in detecting RF signals for RF security and counter-surveillance application. Supplied as a complete with internal NiCd pack, AC wall charger, short rubber antenna and earphone. SEN KNOB: This knob turns the tracer on and adjusts sensitivity. VIBRATION SWITCH : This switch selects the tone or vibration alert output. The tracer can operate for up to eight hours from its fully charged NiCd batteries. Full recharge will occur over 12 to 16 hours. Before recharging the batteries you should be deep cycled occasionally by allowing them to completely discharge to maintain maximum battery capacity. Endoacustica has in a short span become synonymous with the production and distribution of hi-tech, state-of-the-art surveillance systems, both for professional as well as amateur use. Our impressive range of products includes: bug detector, bug detectors, bugging devices tracer, bug tracer, bugging tracer,bug sweeping,bug sweeping services, bug sweep,miniaturized bug detection, environment reclamation, tap defense, tap defence, counter surveillance, eavesdropping detection, wiretap detection, bug detector, eavesdropping equipments detector, audio video bug detector, spyhunter.